Picual variety has a strong personality. Its main characteristic is a bitter touch in the end due to its high content in tannins. Picual variety is the most widely cultivated in the south of Spain. Picual variety has a less fruity flavour and causes a more pricking sensation in the mouth. The fresh EVOO is sort of greenish-yellow coloured. 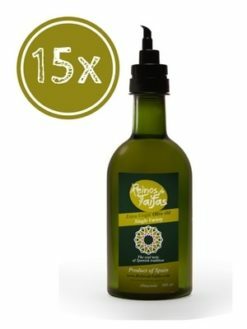 Enjoy the flavour of EVOO Reinos de Taifas Picual for less with the Picual Alfanje Box 3 x 5000ml Bottles. 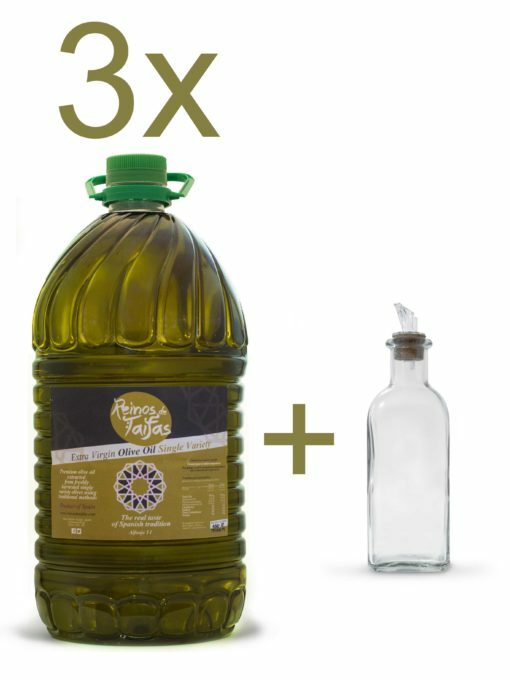 This pack contains three Alfanje bottles (five litres) of Picual single variety Green Gold Reinos de Taifas. This is the best solution for big families, restaurants or deli shops. You can also buy it with other friends to split it after if you want, saving some money. Really good quality and taste olive oil!! 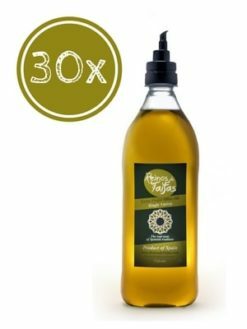 Superior rich and well-balanced taste Picual extra virgin oil. Great service and communication. Will buy again.